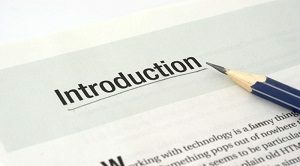 In essence, an introduction generally is the opening paragraph of any particular university essay. In this respect, it is of particular importance for students to know how to write an essay introduction for university. An essay introduction plays a crucial role in the establishing the theme of the work and grabbing the attention of the readers. This part of an essay acts as a kind of a plan that outlines the main points and arguments of the paper. Therefore, it is necessary to consider the main steps of how to write an essay introduction for university. It is important to begin the introduction of an essay with a sentence that grabs the reader’s attention and interest. The best ways to do this is to start with indicating something interesting, providing and considering an interesting quote, providing a certain statistic, or just by telling a story. It is crucial to start an essay with some original and interesting angle through which it would be possible to engage readers in the topic. For instance, if it is needed to state that smoking marijuana is beneficial for human health, it is possible to start the introduction of an essay by referencing certain recent research on the topic from a credible source. There is no doubt that such strategy will attract the reader’s attention and interest while introducing the subject of an essay. It is not advisable to start an essay introduction too broad, for example, by considering how literature helps people to comprehend life. It would be much better to tell the readers what it is needed to know to get their interest in the provided theme. In this respect, it can be stated that the accurate and well-thought-out provision of the needed background will help the readers to better comprehend the matter being presented. As such, this information will provide the context and the overall idea that can be vital to arguing and explaining the main points. As a matter of fact, a good thesis statement should reveal the main essence of a university essay. The thesis statement declares a debatable and argumentative point. Hence, the thesis cannot be an accomplished fact, as it should assert a certain position on a particular topic that a reader can potentially debate with. In a single and clear clause, it sums up the overall mission and purpose of a university essay. In addition, it also acts as the main idea which the writer would argue in the work. Eventually, a good and exemplary introduction of a university essay should not provide analysis and describe arguments, which should be presented in the body paragraphs. An essay introduction should introduce and arrange the main point, rather than provide information to support it. Finally, despite the fact that the introduction is a kind of a plan for the rest of the work, it is not advisable to precisely describe all the methods and techniques which would be revealed in the essay.